The most significant part of the Government’s draft Air Quality Plan was the proposal of Clean Air Zones (CAZ) – so much so, in fact, that they published a separate document explaining how they might operate. 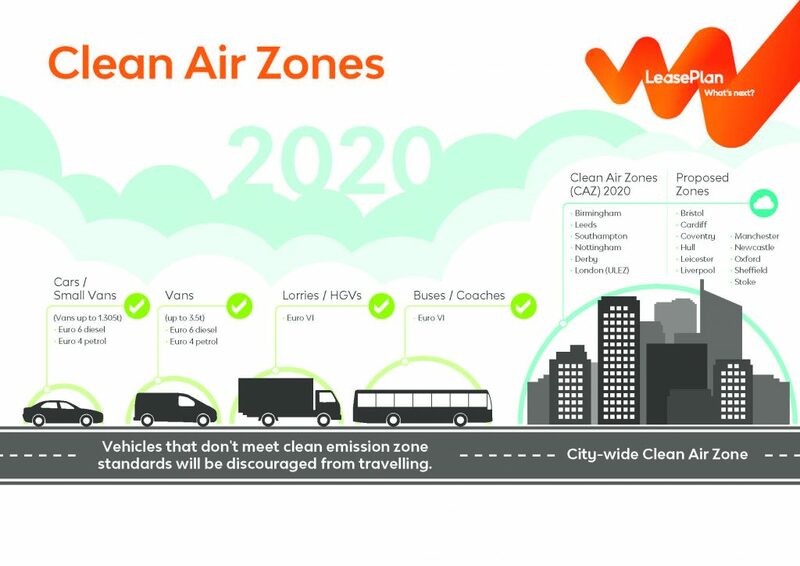 With London committing to an Ultra Low Emission Zone (ULEZ) by 2019/20 you might be forgiven for thinking that Clean Air Zones are all about imposing fees on the dirtiest vehicles travelling through them. But the cities of Birmingham, Leeds, Southampton, Nottingham and Derby are looking into different ideas to reduce emissions from awareness campaigns to support for ultra-low emission vehicles (ULEVs). To find out more about operating a fleet in one of the new Clean Air Zones or if you’d like to find out how LeasePlan can help reduce your fleet’s emissions, get in touch with our expert team today. Simply call us on 0344 493 5840 or fill out our online form.